2015 was another momentous year for the ASU Wrigley Institute, with multiple milestones in solutions, engagement, education and research. School of Sustainability professor Arianne Cease was named among the Popular Science Brilliant 10, the international Urban Resilience to Extremes Sustainability Research Network was established with a $12 million grant, and the Walton Global Sustainability Solutions Services presented a plan to green Albania's schools to the prime minister of that country. 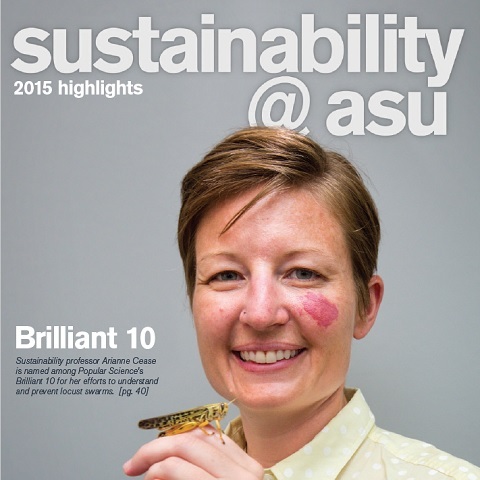 Eight ASU sustainability scientists, scholars and fellows attended the historic U.N. Framework Convention on Climate Change Conference in Paris, School of Sustainability grad student Anna Bettis asked Democratic presidential candidates for their climate change commitments during a televised CNN debate, and household names Tom Friedman and M. Sanjayan joined our growing list of distinguished Wrigley Lecturers. And that's just a sampling. For a more in-depth look at what we accomplished last year, flip through our newly-released 2015 Sustainability Highlights magazine.